Yowza! A group like that is bound to stop traffic! Sunday April 25th marked the first official Cycle Chic Sundays ride. We went on a casual 8 mile loop through Costa Mesa & Santa Ana. We took a lunch break at The CAMP where there were several Earth Day festivities happening. Everyone had a really good time and we are looking forward to continuing Cycle Chic Sundays every weekend! Looks like you ladies had lots of fun, some great weather and lotsa style! Ride on! To mingle in that biker gang would be such exquisite torture. thanks for the luv and support! 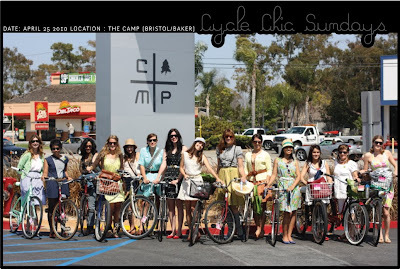 I can't wait till we bring CycleChic Sundays to SF!! yeaoowww! Sounds fun, Eva. I'm in!